The exhibit Life, Liberty and the Pursuit of Happiness is at the Seattle Art Museum from February 26 – May 25, 2009. 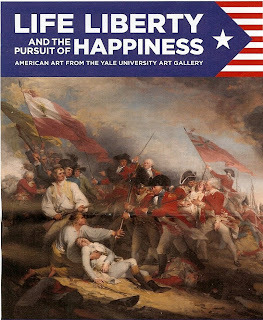 On display are hundreds items from the Yale University Gallery renowned collections of American art. The time period the exhibit covers is roughly the late 17th century to the late 19th century. One of the “stars” of the show is the artist John Trumbull (1756 – 1843) whose painting The Declaration of Independence is an iconic American image. Trumbull’s paintings of key historic events of the late 18th hundred and particularly of George Washington alone could have been the basis of show themselves. Other standouts were the works by Thomas Eakins (1844 – 1916) including the striking rower depicted in John Biglin in a Single Scull (1874), the painting by Winslow Homer (1836-1910) Old Mill (The Morning Bell) (1871), and the photograph of the moon produced in 1864 by George Frederic Barker (1835 – 1910). There were a couple of the challenges in viewing this exhibit. First, was its size. It is an ambitious presentation, too much to grasp in one viewing if you are going to stop and ponder the works. With pottery, glass, furniture, painting, photography as well as other media it can be a bit bewildering to keep focused. The second challenge with this exhibit is to set your expectation for a history lesson – more like different pages torn from a history book. Critical events in American history are rendered in different media. If you have a good grasp of American history then much of the exhibit might be “oh yeah, I remember that”. Else, you’ll be scratching your head trying to recall the significance of this or that event. By the time we got to prints on the subject of the Transcontinental Railroad and the large landscape paintings of the west by Albert Bierstadt (1830 – 1902) toward the end of the exhibit, we were a bit overwhelmed and couldn’t really appreciate them fully. Overall, as a sampling of 200 or so years of American Art the exhibit is successful. But as a viewer you have to work hard to connect the dots in American history and make sense of it all. Try to view the exhibit in two or more visits if you can. The Italian connection - there’s always one if you look, right? 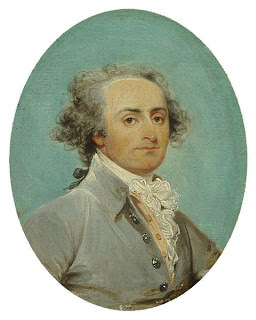 This time it was a miniature portrait by Trumbull of Giuseppe Ceracchi (1751 – 1801) – an Italian sculpture who came to the United States looking for commissions. Trumbull painted Ceracchi’s portrait as part of a series of small portraits used as studies for paintings. We are not sure if Ceracchi ended up in any of Trumbull’s large paintings, but Ceracchi did end up on the guillotine. As part of our proactive fitness quest this spring Travelmarx has joined LA Fitness in Ballard at 1416 NW Ballard Way. Yes we know, it’s the happening club this side of the ship canal and like lemmings we jumped on board. One of the things we’ve been taking advantage of is spin class (called cycle zone) at 5:45am weekday mornings. First, getting up at 5:00am to get to the class is not as bad as it sounds provided you go to bed early and keeping in mind what a friend who told us: "deliver the body". Second, after the class you feel really good. The rest of the day is a breeze. The 50+ minutes of instructor-led “riding” generates a lot of sweat and huffing and puffing. The bikes used are Keiser M3 bikes and they are very nice to spin on. You can spin with the same shoes that you use to work out in or you can use cycling shoes (the pedals of the bikes are SPD – or Shimano Pedaling Dynamics - compatible). The instructors so far for the spin classes (we’ve had four different ones) have been great. - The management is, well to be kind, a bit lacking. Basically, it seems kids are running the shop and that would be kids with not much experience in customer service. It doesn’t help that all decisions seem to have to come from corporate headquarters. Recently, a sign at the front desk informed members in day-glo magic marker colors that the club was out of Q-Tips and Kleenex and was waiting for a shipment. Now Q-Tips and Kleenex aren’t that critical, but why not just run to Fred Meyer around the corner and buy some as a stop gap measure? Suggestion: hire some seasoned staff. - Joining and figuring out what rate you are going to pay varies by the day if not hour. I got one rate on a Saturday when I joined. Then, I got called Sunday to inform me there was a mistake and that my initiation fee and monthly rate would be something different – I okayed it. But, nothing got changed and I’m still at the first rate. Friends all have different plans and rates – it seems. Suggestion: simplify the membership process and make it less variable. - The men’s locker room shower flower is always wet. No mats or anything to keep your feet out of the standing water. Suggestion: put mats down. - Spray bottles to clean down machines and paper towels are woefully lacking. Suggestion: Place more spray bottles about. First post on this subject. In the third class we learned about the fermentation of chocolate. Like wine and coffee, chocolate is a fermented product – as with a long list of many tasty foods. The fermentation happens as soon as the cacao pod is picked from the tree and sometimes while the pod is still on the tree. Since the process is immediate, fermentation is always done near to where the cacao pods are harvested. During fermentation sugar goes to ethanol and then to lactic acid and then to acetic acid. We looked at one study that measured the smorgsborg of alcohols and acids produced during the process. During fermentation, the temperature can reach as high as 46° C (115° F). Finally, we did a “cut test” where we sliced open some fermented beans and looked at the insides and learned to judge whether the fermentation had not gone long enough (purplish color) or about about right (brown). For part of the class talked about the three cacao types: criollo, trinitario, forastero. Trinitario (originating from Trinidad) is a cross between criollo and forastero. However, today any sample of a chocolate bean (and we looked at some genetic studies) is are rarely a pure types as hybrids abound. So be careful of bars touting a pure cacao type. In the fourth class we traced the history of chocolate from the Olmecs (1400 – 400 BCE) to the Mayans (250 – 900) to the Aztecs (1325 – 1521) and into 17th century England. Chocolate originated in Central America and although it was introduced to Europe by Columbus (1451-1506) it was Cortés (1485-1547) who was responsible for sending back some of the first recipes on how to use it. We sampled a recreation of a Mayan/Aztec chocolate drink - chocolate, honey, corn meal, and spices – specially created for the class. In 17th England John Chamberlain published a book The Manner of Making of Coffee, Tea, and Chocolate (1685). In this book there are recipes for mixing chocolate with various different ingredients to improve specific ailments and balance out the four humours. We sampled two liquid chocolate concoctions, one with endive water mean to cure bile and melancholy and another with rhubarb water meant to cure obstructions (constipation) and cold liver. 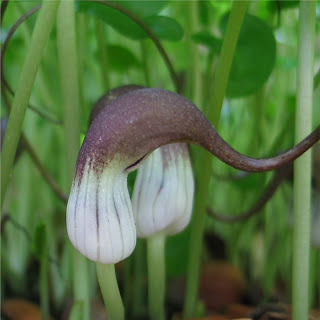 Another springtime favorite plant here at Travelmarx headquarters is the Arisarum proboscideum (mouse plant or mouse tail plant). It grows in a well-lit but no sun location on the north side of the house and is increasing each year. The flowers can go unnoticed because they are under the leaves, so you need to stop and get down on the ground to appreciate the them (how the photo above was obtained). Best of all is that there is an Italian connection because this plant is native to Italy! A. proboscideum is a member of the Araceae (or Arum) family. This family contains members that you often see as houseplants: philodendron, peace lily (spathiphyllum), and anthurium among others. What descriptive information can we extract from the scientific names (binomial nomenclature) for the mouse tail arum? The genus name Arisarum was a name given by the Greek botanist Dioscorides (ca. 40-90) to this plant – not much more to go on. The species name proboscideum comes from the Greek proboskis “elephant’s trunk” referring to the long curved tip of the inflorescence. Update: 2012-04-28. For more on this plant see Soholm Pottery and Arisarum proboscideum. Sometime last week I passed 1,000 miles to work. What this means is that I biked 1,000 miles as part of my commute. (I bike for part of it and bus the rest – previous post.) 1,000 miles divided by approximately 8.5 months is about 115 miles per month. I’m feeling green. 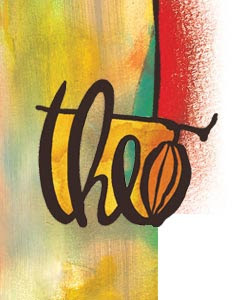 Theo Chocolate located in the center of the universe is sponsoring a Chocolate Academy (pdf) where you can earn a degree in “chocolatology”. We missed the CHOC 101: The Real Thing class (the first) and picked up with the series with CHOC 102: Sinful and good for you?. Andy McShea, Theo’s CEO and head scientist was presenting. We focused on what is known and not known about the antioxidants in cacao from plant to finished product (chocolate bar) and the role of antioxidants in health and aging. In particular, we focused on epicatechin – a polyphenolic antioxidant found in plants – which is the primary antioxidant in chocolate. Everyone usually talks about theobromine as the interesting chemical in chocolate, but the catechins are where it’s at. Take away from the lesson: chocolate has a fair amount of epicatechin in it and hence antioxidant potential. There have been studies to understand how chocolate’s antioxidant properties affect health. The studies are encouraging, showing some benefit, but there are too few studies and not enough participants to really draw any definitive conclusion. For now, enjoy (dark – more epicatechin) in moderation as part of a balanced diet. After the presentation we tasted some pre-conched and post-conched Theo chocolate as well as some special chocolate blends that were prepared for the class. In the interest of fairness some Hershey’s Special Dark and Dove were provided for comparison. The Hershey’s bar is something like 45% cacao - essentially a milk chocolate. But why does it look so dark? Because the alkali process (“dutching”) of the chocolate darkens while destroying antioxidants. Also, look at a Hershey’s label. The first ingredient is sugar by weight. Why eat a chocolate bar that has more sugar than chocolate? Finally, the Dove chocolate we sampled tasted like chocolate pudding – again, an artifact of the alkali processing. I can’t say we won’t ever eat Hershey’s or Dove products again but we’ll think twice about supporting products whose are over-processed and have ingredients not easily recognized like PGPR or TBHQ. Luckily there are very good chocolate options today, especially artisanal chocolate, that use basic, identifiable raw ingredients and care in the processing. The Chocolate Academy is organized into four series. The classes so far (first series) are held at the “theonista” show room which used to be the old Trolleyman Pub of Redhook brewery before it moved out of Fremont. Not that the Trolleyman Pub wasn’t a treasure in a sense, just that we’ve been to Theo more than the Trolleyman – which probably tells you nothing more than we like chocolate more than beer. The presentation we attended was informally projected on a wall with some fold out chairs and miscellaneous comfy furniture to sit on. We are looking forward to this week’s class CHOC 103: Chocolate for Nerds. 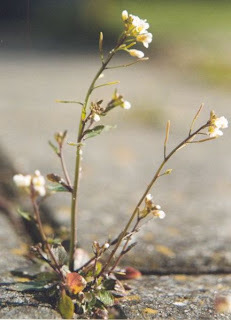 The story of bitter cress continues with Arabidopsis thaliana – (thale cress, mouse-ear cress) – a plant in the mustard - Brassicaceae - family. This plant’s small size, the small size of its genome, and the relatively short time from germination to mature seed facilitate plant genetic studies. It is called a model organism and it is the drosophila of the plant world. Arabidopsis is the first plant to have it genome sequenced. In fact you can look it up at the Arabidopsis Information Resource site. This plant must be pretty special since it has its own web site. The site is definitely not for the layperson, but there is a nice history page about Arabidopsis there. In my Plant ID class we keyed out the plant in Hitchcock and Cronquist (with a little help from the instructor). Though non-native, Arabidopsis appears in H&C on page 152. We went off track trying to identify if the seeds were biseriate (in two rows) or uniseriate (page 147). We initially chose biseriate and were wrong. Bittercress plants are in the mustard family, Brassicaceae. The family name derives from the Latin name for cabbage. (The older name of the family was Crucifereae meaning cross-bearing and referring to the form of the four flower petals typical to this family.) There are two bittercresses which look very similar to my eye: Cardamine hirsuta and Cardamine oligosperma. The genus name Cardamine is derived from the Greek “kardamon” for a kind of cress or referring to a Persian or Indian herb with pungent leaves. Hirsuta refers to the hairs that grow along the stem and oligosperma refers to the fact that this species produces few speeds (Greek “oligos” for few and “sperma”for seeds). Oligosperma is native to the Northwest and has the common name of little western bittercress. Hirsuta is native to Europe and has the common name hairy bittercress; it is considered the more weedy of the two and is the one which grows freely (mostly in spring) in the yard. I guess you can eat the leaves but collecting them would be a chore.